Are You as Old as Your Legs? Taking up gym training again after quite a lengthy layoff, we find that somebody (maybe Old Father Time: has taken a lot of spring out of our legs. We have always been blessed with pretty strong lower limbs, and this comes as quite an unhappy surprise. Maybe the fellow was right who first said, "You're as OLD as your legs." We have been working out with Frank Stranahan, who is a great guy for Squats. He says that unless he does quite a number of heavy knee bends, his legs tend to tire during a golf tournament, and when you train with a lug like that, you are forced to do some fairly heavy Squats in self defense! We hadn't done any heavy ones (off a rack) for three years, since we moved to Florida. Al the leg stuff we did was a few light Squats with weights we could easily press and put on the shoulders. So the first time we did Squats with upward of 200 lbs we found that the spirit might be willing, but the legs were weak. Next day we were stiffer than a centipede with arthritis. We could feel nothing but pain below the waistline. Paralysis would have been a blessed relief! Further than the Squats, Frank likes to do Snatches and Cleans, and here we were again unpleasantly discomboomerated. We seemed to have a fair amount of pulling power, but getting down under the bar was simply torture. The legs soon became rubbery. All of a sudden we felt like an old man. The days of 400 lb Squats and 230 lb Snatches seemed very faint and far away. This is a very odd feeling when you still seem to be fairly strong in the arms and shoulders. So we have been training differently the past month than we ever did before in our life. Not for us the Presses and Curls and muscle-spinning to get 18-inch biceps. We wouldn't be able to do anything with them if we had them. Instead, we are back at the basic Squats, and Hacks and Calf Lifts. And brother -- it's murder! The nice part about working in a gym again, after several years of hermitting, is that the equipment makes it easier for you. We are just now realizing how comforting it is to have squat racks, calf machines, and other deluxe gadgets. And, for the first time, we can also actually tell by personal experience how beneficial such things can be. The simple calf lift machine makes it not only easier to do this rather monotonous movement, but allows you to better concentrate on the one-and-a-half bounce at top and bottom, which makes the exercise doubly effective. Further, we are finding that the calves do have something to do with leg spring, which we always doubted before. We think British lads have something on the average American as far as legs are concerned, and particularly in the calves. More walking and cycling owing to less automobile transportation give you better legs. Over here in America, the calves are practically nonexistent on the average man, because he rides instead of walks. Further, the British type of football builds better legs than the American brand, because the action is more sustained. More time is spent lining up between plays here than in action. Whatever the reason, it is quite evident from PC photos that the Briton has better calves. The practice of the Squat is not the answer to the calf problem. The best squatter we ever trained with had 28-inch thighs and 15-inch calves. He sneered at any effort to develop the lower limb. It won't help you lift more weight, he maintained. 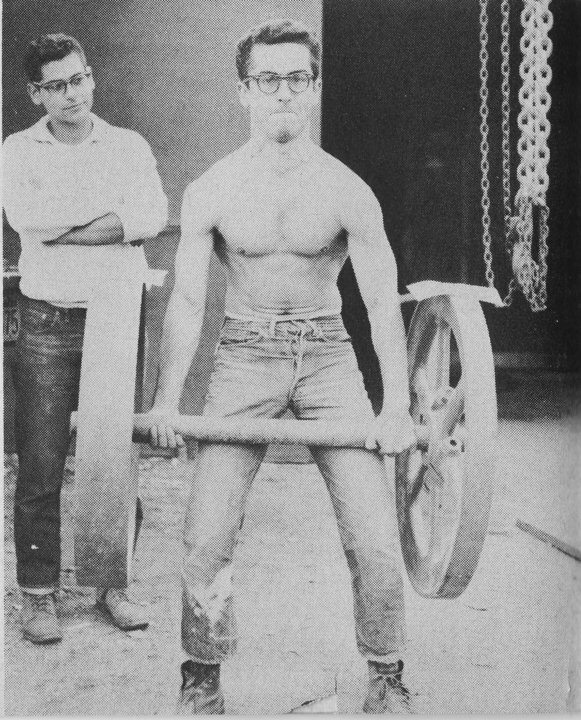 Yet, after 40 years in the barbell game, we are suddenly wondering if he wasn't wrong. Certainly it does have something to do with leg spring, and leg spring helps practically any type of lifting effort. But apart from the spring, and the effect on lifting, we feel that the calf development has more to do with making the legs look good than the most powerful thigh musculature. More and more we have come to he belief that a man's best physical points are wide shoulders, a good V-taper, swelling deltoids, and well developed, bulging calves. These are exactly the places where Steve Reeves was particularly gifted, and to the casual public, he was the best looking male physique on record. Another place we find that old age gets in its licks is in the small of the back. The fun is out as far as deadlifts are concerned, and here we propose to solve the problem differently than with the legs. We just ain't gonna do no Dead Lifts. It isn't worth the effort. Here too, much to our surprise, we found 30-year old Stranahan also felt the effects of age. He told us that Dead Lifts were simply killing him, and that his back often ached as he drove hither and yon in his Cadillac (too, too bad!). Yet, because he thought heavy Dead Lifts strengthened him, he was loath to give them up. So we advised, -- why not keep the Squats and give up the back work? Actually, heavy Squats work the back in the way it should best be worked, in combination with the thighs. So he gave up the Dead Lifts, and a week later said all the pain had disappeared. Further, his lifts were improving, to say nothing of his golf. This has made us wonder whether many other barbell addicts are not overdoing the heavy Dead Lifts. Why should anyone put up with an aching back when it is unnecessary. Our personal experience indicates that anyone who does Snatches and Cleans gets all the back work he needs. And anybody who is foolhardy enough to combine heavy Squats and heavy Dead Lifts (up to the limit) in one workout gets just what he deserves -- prolonged pain, stiffness, and lack of spring. Another good conditioning exercise we have found during our convalescence is the continuous pull-up and press, with a moderate weight. Until you try this very vigorous exercise up to 8 or 10 reps, you have no idea what a good basic movement it is. The panting and puffing may well be compared to the 20 rep Deep Knee Bend. We have several new pupils using this, and they are growing very fast. Since there aren't too many of the really rigorous all-round exercises, this one deserves more attention than it has previously received. This one, by the way, is a Bob Hoffman favorite. To the aging athlete, the presence of padded incline benches in the modern gym is also a great comfort. Here we can relax, after our strenuous leg work, and do, with dumbbells, the arm and shoulder exercises we simply wouldn't do as much of if we had to stand up throughout. So -- after a month of torture -- our report to readers is . . .
We think we will live! There is a way to achieve not just ordinary growth, but accelerated growth by using a single exercise in a program that may make your regular routine seem, well, just ordinary. The program is based on the principles of the time-honored, 20-rep breathing squat routines made famous by, among others, Iron Man founder Peary Rader. While most bodybuilders have some knowledge or experience with the growth potential of the various 20-rep squat routines, not so well-known are similar workouts using other exercises in a related approach. One such routine is a modification of the squat regimen that uses the deadlift as the key exercise performed in a way that emphasizes its often untapped growth properties. Integrated properly into a total program, this one exercise and routine can greatly increase your chances of muscular growth. Call it anabolic exercise in an anabolic routine within a larger, coordinated, total anabolic program -- which can be as simple as including good nutrition and optimum recovery and rest. You could, of course, claim that all the exercise you do is anabolic, or you could even maintain that exercise itself is not actually anabolic, but that growth occurs through the rest and recovery period following exercise. And technically you'd be right. To put it in simple terms, however, exercise -- specifically weight training -- is the first active step in the complex process of muscular growth that we refer to as anabolism. And growth -- muscular growth -- is what you're after. The anabolic deadlift workout stimulates growth in the same way that the 20-rep breathing squat routine does: it works a large area of the body, requiring great effort and exertion, which further involves not only specific muscles, but also the muscular system in general and the nervous system in an intensive way. The metabolism, the vital energy-producing processes of your body, gets a boost in efficiency. The deadlift obviously involves the muscle groups that overlay the back -- the traps and lats -- which are wide sheets of muscle. It also involves the smaller muscle groups in the upper back, such as the teres major, infraspinatus and rhomboids, which can result in deep development, in addition to the all-important spinal erectors. Some of these muscles or groups of muscles are stabilizers, or are not the primary muscles being worked. For example, although the lats are used in the movement, they usually receive little direct action from it, as opposed to the erectors, which receive a large share of the stimulus and do a lot of the work. You know this if you do heavy regular deadlifts in your training. The erectors are where trainees usually feel the most soreness, although the soreness can run up and down the back to the traps and out across the shoulders and is generally felt all the way down through the erectors and often into the hips. This soreness reminds us of how extensively the deadlift does work the body; it doesn't affect just the lower back. The large array of muscles and the complex network of nerves running through the entire spinal area make this a potentially huge growth opportunity for the bodybuilder. With so much muscle and nerve involved, however, the exercise is also very demanding. If you've trained hard on the squat or on a 20-rep squat routine, you know the demands that particular exercise makes on the body. You feel extreme fatigue -- but you grow. No exercise is as demanding on the muscular system, the nervous system or the body as a whole as the deadlift. The deadlift probably works even more muscle than the squat -- and that can be quite a payoff. So, let's put this demanding, productive exercise into a routine. As you can see, you do just one set of deadlifts for high reps -- 15 to 20. In all the other exercises you do two sets after the warmups. This workout utilizes the same basic framework as the 20-rep squat routines. Here, however, you should do the whole-body workout only two times per week -- as opposed to three for the squat routine -- and do the deadlifts at only one workout. One hard set for the deadlift only once a week? How can that be enough? After you do the routine, you'll see why. You should work with a poundage on your deadlift that is challenging enough on the 15-20 reps to make it difficult for you to go to failure. The difficulty of the exercise itself provides the intensity, along with the fact that you have to fight to get the required high number of hard reps. Also, do not go to failure on your other exercises in this routine. You want to conserve energy for your assault on the high-growth deadlifts. When you do the deadlifts, start conservatively with a poundage that matches your bodyweight or perhaps less to begin with, and work into the routine gradually. Eventually go to within a couple of reps of failure. In the other workout of the week substitute rows with a moderate or even light weight for the deadlift, or do chins instead. This will augment your recovery and keep you from overtraining your back. The lighter recovery work can also help to set up further muscular growth. 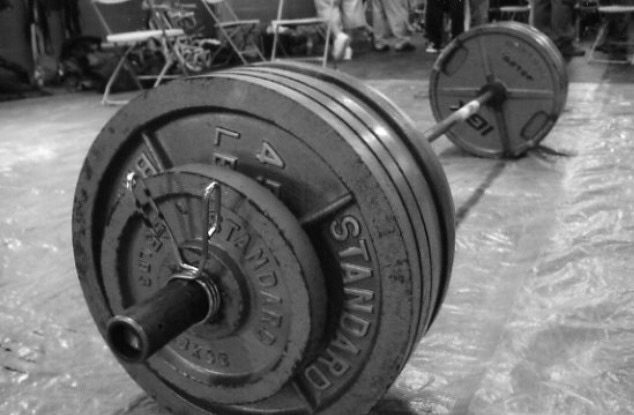 Here's how to do the deadlift correctly, safely and productively for this type of routine. Stand with your feet slightly less than shoulder-width apart, bend your knees and use an over/under grip with your hands approximately shoulder-width apart. Keep your back flat when you pull the bar upward, and try to pull in a controlled, smooth motion. Don't jerk the bar. Pull the bar close to your body, and don't bounce it or use momentum between reps. Instead, maintain control as you lower the bar, pause at the bottom with the bar on the floor, take a couple of breaths, reset and gather yourself and lift the next rep. No loose, cheating or bouncing reps and be sure to breath whenever you need to. Don't hold your breath if you can help it. Do a powerful, controlled, effective and safe set. What kind of gains can you expect from this routine? You'll find that the high-rep anabolic deadlift makes your whole body feel worked, and that's where you'll get your gains -- all over in every muscle groups, certainly not just in your back. The hidden growth benefit of the high-rep deadlift is that it seems to stimulate the internal organs, glands, etc., for that mysterious extra growth effect. Unlike so many exercises that promote a kind of 'local' growth, this anabolic approach promotes 'full' growth. So not only does your back grow, but your whole body's muscle mass increases. Another benefit of this routine is metabolic stimulation. If you are overweight, your metabolism will get a kick toward normalization by your speeding up, and as with the 20-rep squats, the routine will not only increase fat burning, but will also give you added muscle. For the thin, underweight trainee, it will help your already fast metabolism to normalize, which will allow you to increase your power and mass. Whatever your present condition, this exercise will make your metabolism more efficient and push your body toward an ideal metabolic state. Another hidden advantage of this type of deadlift routine benefits hardgainers. Most hardgainers are thin, have poor leverage in the power/mass exercises and have thin legs, so squatting is often the hardest exercise for them to master and do appropriately. A thin bodybuilder almost always has better leverage on any of the pulling exercises, including the deadlift. So while the exercise is not in any sense easy, it should be easier and more productive for the thin hardgainer than the squat. Later on, after a thin man makes progress on this routine, his squat power should also pick up, so increases can be made there too. If you are a struggling hardgainer you should seriously consider doing the anabolic deadlift routine for a boost in gains. Some other things to keep in mind when doing this regimen. It is not for bodybuilders who have back issues. If you have a back problem, deal with it before attempting this routine! For the rest of you, if your back feels too fatigued after some time on this program cut down on the poundages and occasionally take an easier workout. Also, if you are having trouble recovering or making gains, pull back on the frequency of high-rep deadlifting -- only do it once every 10 days or so. As this is a severe and demanding routine once the weight becomes challenging, try to cut down on outside activities where possible. Extra rest and sleep will help you build energy, and your nutrition should be sound and sensible. The anabolic deadlift routine can be one of the best natural weapons in the bodybuilder's arsenal. Be prepared to work extremely hard at it. Once you have a powerful inner attitude an assert your will appropriately more muscular growth will be yours.